Week Four of The GAMBIT Summer Program is over and the interns have created their first playables and are getting ready for their first focus test in week five! Visiting Singaporean Lecturer, Andrew Tan, gives you his view of the fourth week of the 2011 GAMBIT Summer Program. From June 6th to August 8th, 2011, the US Lab of Singapore-MIT GAMBIT welcomes over 40 interns from various Singaporean Universities as well as interns from Berklee College of Music, Rhode Island School of Design and of course, MIT to participate in a nine week intensive program creating videogames from research begun at MIT and in various Singapore universities. We have also invited mentors from Singapore to assist and observe the interns so during this summer's program we can update you on the intern's progress through their notes and photographs. The 4th week is over and so comes the first playable, hoo-yah! 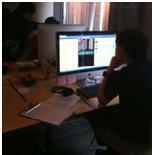 The teams have been really working hard and testing daily to achieve this milestone. Looking at the daily builds and the first playable, all 6 teams have done well and is progressing fine. The soft-body physics team has good graphics and multi-user gameplay. The LGBTQ team has an interesting combat system. The open-narrative team is moving along well with the story. The procedurally generated-game has very nice artwork and the back-end content generation is in good shape. The social game is online on Facebook. The AI game has build up some interesting levels. So on the milestone delivery, the QAs went and started testing each others game. A lot of feedback was taken and considered. The other team members and Gambit staff also chip in and tested. Moving forward to week 5, the teams will take all this feedback and shape their game further. Personally, I felt that there is still a lot to improve on. The media design is coming along fine. There is still a fair bit to improve on in terms of UI design and gameplay. • I felt that having this milestone is really useful. All the groups I talked to really look towards it; some with fear while others with eagerness. As an academic, this milestone "forces" the team to do a self-check; are they behind schedule or doing ok. As a former developer, having regular milestones are always good; it's a strong indicator that the team is moving forward... hopefully. • Having all the QAs come together to test each other's games is a really good idea. Different perspective are given and gathered, which is always good especially since the games will be released to public eventually. • It never ceases to amaze me the tenacity of humans to achieve when put under the right conditions. In Gambit, given the crunch time, proper guidance and conducive environment, the teams have achieved quite a fair bit. • I have this underlying feeling that some teams, sub-consciously, might have an over-emphasis on media design. This is good but at this point in time, the gameplay is key. • Though the first playable is pretty good, there are much room for improvements. Hopefully, the teams have learnt enough from the feedback and will improve on their games further.